A NINETY-year-old Good Samaritan is facing up to 60-days in jail after he was arrested by police in Florida for serving a meal he had prepared to the homeless. 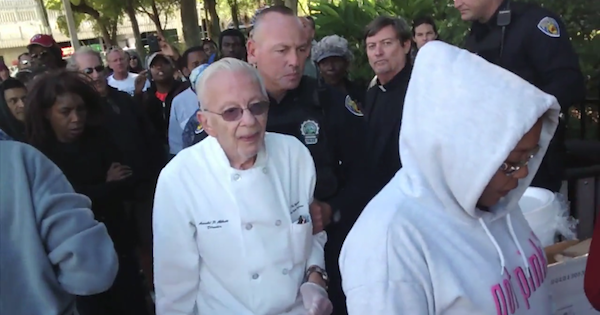 Arnold Abbot was distributing food to the needy in Fort Lauderdale when he was stopped by cops who said his actions were outlawed by a new local ordinance that bans the sharing of food in public places. “One of the police officers came over and said ‘Drop that plate right now,’ as if I was carrying a weapon,” Mr Abbott told local TV network KHON2. Apparently oblivious to the looming public relations disaster Fort Lauderdale Mayor Jack Seiler had earlier promised to arrest anyone breaking the new ordinance. “Just because of media attention we don’t stop enforcing the law,” said Mayor Seiler. Arnold makes hundreds of meals every week for the homeless in Fort Lauderdale’s Sanctuary Church. “I fully believe that I am my brother’s keeper. Love thy neighbor as thy self,” said the church volunteer. He was arrested and charged along with two church ministers. KHON2 said the three face up to 60 days in jail and a fine of $US500. Arnold was not put off by the arrest and promised to be back on the streets with food the following day. Good for him. We can understand that there must be laws and state ordinance etc. However, when feeding the poor and hungry has become a ‘crime’ then perhaps we are left wondering who are the real criminals? Please contact him & ask him to reconsider this new local ordinance that bans the sharing of food in public places. Also PLEASE share this story far and wide. Thank you. Unreal. Of all the things to worry about…sharing food. Unbelievable. Only in Florida and well Texas both Right Wing put yourself up by the boot straps states. This is what we get in a world run by the Koch brothers !! Shameful !!! This is absurd!! Had to be Flori-duh!! WTH??? This could have been handled much better. If the gathering of people was bothering shop owners, then they should have helped find a solution. Feeding someone in need is not a crime. 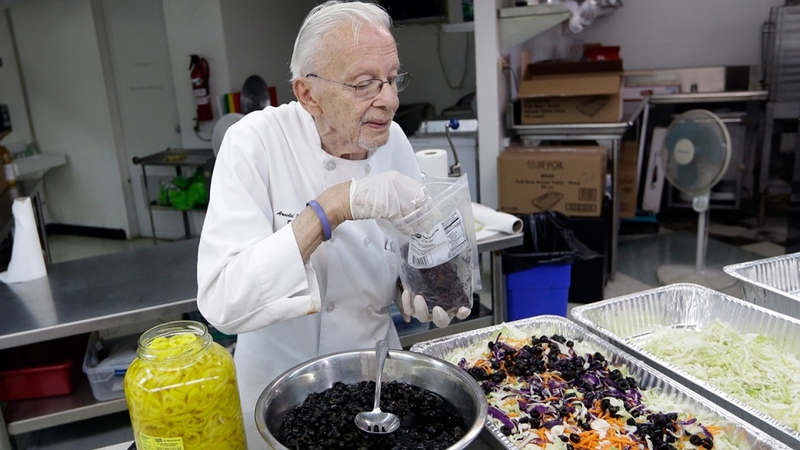 A 90 year old man feeding people in need for twenty years is not a crime. A veteran feeding people in need is not a crime. Stopping the feeding of people in need is more than a crime – it is a shame.